A story so incredible, it could only be true. Jim Carrey stars in the “outrageously funny” (Rolling Stone) true story of a spectacularly charismatic con man’s journey from small-town businessman to flamboyant white-collar criminal, who repeatedly finds himself in trouble with the law and on the lam – all in the name of love. Costarring Ewan McGregor, I Love You Phillip Morris is an unbelievably true comedy that’s being called “the best performance of Carrey’s career” (Village Voice). $112.520 thousand on 6 screens. With a title like I Love You Phillip Morris, you might expect a caustic dark comedy about the cigarette industry ala Thank You For Smoking. You’d expect wrong – very wrong. Instead, you’d find an offbeat romantic comedy. Virginia Beach police officer Steven Russell (Jim Carrey) lives a quiet, traditional life with his wife Debbie (Leslie Mann) and kids. That all changes one day when the adopted Steven decides to find his real mother. He locates her (Marylouise Burke) but she wants nothing to do with him. Since Steven only joined the police to find his real mom, so once this anti-climatic event occurs, he quits the force and uproots his family to Texas. There he takes a job managing produce at a grocery store and they seem to live the perfect family life. Well, except for one thing: Steven’s a closeted gay man. He screws anonymous men on the side and lies to Debbie about his whereabouts. Until Steven gets in a major car wreck and he has what he considers to be an epiphany. He decides that life’s too short to live by others’ rules, so he chooses to start over and embrace his homosexuality. That sends Steven on another journey, as he moves to Florida, dates Jimmy (Rodrigo Santoro) and lives “high on the gay hog”. He can’t make enough money via honest means, so he becomes a con artist to rake in big bucks through all sorts of fraud. This eventually sends him to jail, where he meets fellow inmate Phillip Morris (Ewen McGregor) and once again changes his path. Now he wants to free his apparent soul mate so they can start their perfect life together. At the start of the film, we learn that Morris comes based on real events. I thought that was a goof, as some flicks offer that disclaimer although they’re totally fictional - Fargo, anyone? So imagine my surprise when I learned that Morris does take fact as its inspiration. That falls into the “you learn something new everyday” category, and it makes me wish the DVD came with a nice documentary about the real Russell; it’d be fascinating to get a better picture of the actual events. Whatever those were, Russell’s tale makes the leap to the big screen in a pretty entertaining way, though I don’t think the story would work as well without the consistently terrific performance from Carrey. At this point in his career, Carrey tends to either shoot for fairly quiet, unassuming parts like his lead in Eternal Sunshine of the Spotless Mind or the wilder roles that brought him fame. Actually, as time progresses, Carrey more often favors the former than the latter, but flicks like 2008’s Yes Man show that he’s not abandoned his bread and butter. Carrey’s take on Russell resembles a somewhat more real-world version of his Liar Liar lawyer. This is especially true when Russell goes through his scams, as those allow the actor to indulge his skills as a comedic chameleon. Carrey doesn’t go over the top with his antics, but he brings his unique talents to the fore and creates funny material with his turn as Russell. McGregor’s work as Morris seems less strong. He comes across as awfully coquettish; I constantly worried he’d actually say “I do declare!” Perhaps that’s what the real Morris is like, but the character becomes annoyingly fey, and he doesn’t connect to Carrey very well. The movie fares best when it sticks with Russell on his own; when we see him interact with Morris, it sags. Still, there’s more than enough of Carrey’s con man to make the movie entertaining. It certainly takes a lot of turns along the way, so if you don’t already know the real-life story, I doubt you’ll anticipate the twists. While not a great film, Morris is usually enjoyable, largely due to a strong lead performance from Carrey. I Love You Phillip Morris appears in an aspect ratio of approximately 1.78:1; the image has been enhanced for 16X9 televisions. The movie came with an erratic, unexceptional transfer. Sharpness became one of the up and down elements. Close-ups looked fine, and occasional wide shots seemed decent. However, much of the flick came across as a bit soft and indistinct; these concerns were never extreme, but a lot of the movie appeared somewhat mushy. No issues with jaggies or shimmering materialized, but some artifacting occurred, and the image could be a bit blocky. At least I didn’t see any edge haloes, and source flaws remained absent; no specks, marks or other concerns materialized. With its various lavish settings, Morris arrived with an occasionally bubbly palette. Unfortunately, the DVD didn’t replicate it terribly well. At best, the colors appeared reasonably lively, but they usually seemed somewhat flat. The hues weren’t bad, but they should’ve been better. Blacks were passable, while shadows tended to be a little thick. Though I thought the transfer had its moments, it remained pretty mediocre. While not exceptional, the Dolby Digital 5.1 soundtrack of Morris suited the material. Only occasional scenes used the surrounds in a dynamic way. Some prison elements broadened the spectrum, and the sequence in which Steven and Phillip’s letters filled their heads worked around the room well. Mostly the mix favored general ambience and music, and it displayed those in a perfectly adequate manner. Audio quality seemed fine. Speech consistently remained natural and distinctive, without edginess or other problems. Music displayed nice range and clarity, while effects showed solid clarity and accuracy. This wasn’t an exceptional soundtrack, but it fit the movie. We get a few extras here. We open with an audio commentary from writers/directors John Requa and Glenn Ficarra, producers Andrew Lazar and Far Shariat, chief lighting technician Max Pomerleau and director of photography Xavier Perez Grobet. All of them sit together for this running, screen-specific look at script/story issues, facts and liberties, sets and locations, camerawork and visuals, cast and performances, editing/deleted scenes, and a few other topics. Tracks with multiple participants sometimes flop because they’re too “busy”, but this one manages to balance the five speakers well. It comes with a light, fun tone that allows it to entertain while it informs. We get a good take on the production in this likable, interesting commentary. The Making of I Love You Philip Morris goes for 11 minutes, 50 seconds and includes remarks from Requa, Ficarra, and actors Rodrigo Santoro, Jim Carrey, Leslie Mann, and Ewan McGregor. They cover the project’s roots, cast, characters and performances, and the directors’ work. Other than some shots from the set, we get little of interest in this promotional piece. 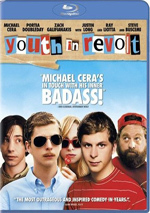 Seven Deleted Scenes fill a total of 16 minutes, 46 seconds. We find “Honey I’m Gay” (0:20), “Storm Sequence” (3:59), “Desk Montage” (0:48), “Gala Ball” (1:40), “Golf Tee Off” (0:49), “Jimmy Flashback” (8:19) and “Cleavon In Bunk” (0:51). Some are interesting – “Golf” and “Bunk” are especially amusing – but virtually all seem superfluous, as they don’t do much to elaborate on themes already found in the final flick. In particular, “Jimmy” seems redundant; the finished movie gives us a more concise, elegant take on the material it displays. Still, it’s interesting to check out the cut material. The disc opens with ads for Good Hair, My Best Friend’s Girl, Mystery Team and The Winning Season. These appear under Also from Lionsgate, and the disc throws in three trailers for Morris as well. 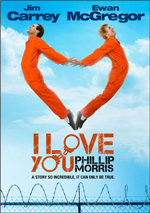 Jim Carrey helps turn I Love You Phillip Morris into a generally entertaining flick. Some aspects of it fail to ignite, but it comes with an interesting story and a performance from Carrey that elevates it. The DVD offers decent picture, good audio and a few supplements headlined by deleted scenes and a useful audio commentary. The quirky Morris merits a look.